UPDATED: Thu., Feb. 8, 2018, 9:20 p.m.
MOSCOW, Idaho – Seeking an audience commensurate with the event, Idaho and Eastern Washington hope a meeting Friday between two of the Big Sky Conference’s most prolific scorers and best teams will pack Cowan Spectrum for a contemporary rivalry the way it is filled for UI’s traditional rival. “We hope to see a WSU crowd,” Vandals coach Don Verlin said. The presence of Idaho’s Victor Sanders, the Vandals’ No. 2 career scorer, and Eastern Washington’s Bogdan Bliznyuk, the Eagles’ all-time scorer, ought to help the gate, and the game has important implications for the Vandals (16-7, 8-3) and Eagles (12-12, 7-4), sitting third and fourth, respectively, in conference standings. The top four teams receive first-round byes in the Big Sky tournament. “This time of the year we are playing for seeding,” EWU coach Shantay Legans said. For the Vandals, the outcome could affect the tone of their renewed rivalry with the Eagles, whom they acquired as a travel partner when Idaho rejoined the Big Sky in 2014. In their nine games since Idaho’s return, EWU holds a 6-3 advantage. 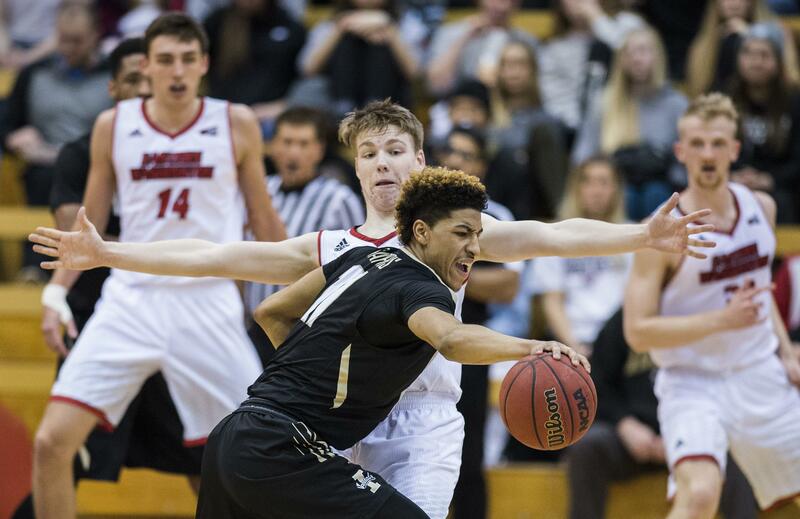 If there is mystique in that, Idaho tarnished it somewhat when it roared back from a 20-6 hole at the start of the game to overtake the Eagles 58-51 in Cheney in January, dealing EWU its only home loss in the league. Verlin believes recent history is only marginally important when the ball is tipped. “All that stuff goes out the window in a rivalry game,” he said. Bliznyuk and Sanders should be a marquee attraction. After lighting up Sacramento State for 40 points on Feb. 1, Bliznyuk has 1,864 career points and is averaging 20 points a game. Sanders has 1,665 career points and is putting up 19.6 a game. “There are no secrets in this game on either side,” Verlin said. That may not be entirely correct. After Idaho got off to a sluggish start in a win against North Dakota, Verlin moved Sanders from a wing to the point and the Vandals’ offense responded. Verlin said after the game the move was based on “feel” and he reiterated that this week. The Vandals have continued to give Sanders time at the point in their subsequent wins over Portland State and Sacramento State. Sanders said the position change for him does have the potential to mess with an opponent’s defensive stragegy. “If your game plan was to trap me after the first pass, I have the first pass,” he said. When Sanders got in early foul trouble against Sacramento State and saw a 47-game double-digit scoring streak end with eight points, Perrion Callandret came off the bench and returned to point guard with a season-high 23 points for the Vandals. In Callandret’s two games off the bench, Idaho’s bench scoring rocketed from 15 points per game to 32.5. “(Callandret) was really, really aggressive getting his ball to the basket. I thought he played excellent,” Verlin said after the game. “Every once in a while we change things up,” Verlin added this week. Bliznyuk has initiated offense all season for EWU. He ranks third in the Big Sky with 3.8 assists per game. The Vandals’ Callandret is ninth in the league with 3.3. Bliznyuk and Idaho’s Brayon Blake might stage a battle on the boards. Blake is the Big Sky’s leading rebounder, averaging 9.3 per game, including an impressive 1.9 offensive rebounds per game. Bliznyuk is ranked eighth in the league with 6.0 rebounds per game. In the first meeting, Bliznyuk hit for nine of the Eagles’ first 20 points, but Idaho shut him down for the final 32 minutes. Verlin predicts the recent past will be prologue when it comes to the game’s offensive showing. Published: Feb. 8, 2018, 5:47 p.m. Updated: Feb. 8, 2018, 9:20 p.m.